In this week’s AP top 25 poll, the top six are unchanged: Notre Dame, UConn, Oregon, Baylor, Louisville and Mississippi State. South Carolina’s 89-week run in the top 10 ended, as they fell to No. 13. West Virginia is in and Georgia drops out. WomensHoopsWorld’s weekly poll is similar. How rhythm might be a key for South Carolina in shaking off a bad shooting night vs. Maryland. “Completely different” Iowa State is off to a strong start. Georgia is searching for an identity after dropping two straight games. Duke’s back court impressed in their win yesterday. Asia Durr is poised for an epic final chapter at Louisville. Why Teaira McCowan and Anriel Howard are college basketball’s best 1-2 punch. Rodrea Echols is providing stability at point guard for New Mexico State. The development of Cece Hooks’ jumper for Ohio. Louisiana Tech’s Kierra Anthony is ESPNW’s player of the week. Coach’s Chair: Amy Williams, University of Nebraska. Syracuse’s Quentin Hillsman schedules with an eye for the NCAA Tournament. Virginia Tech is unbeaten, but coach Kenny Brooks isn’t happy. 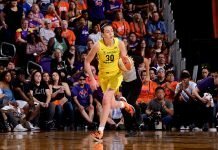 The WNBA is at a crossroads. Sue Bird discusses her new role with the Denver Nuggets.